In early lessons, students very often want me to tell them how to sit/stand/walk/whatever in the ‘right’ way. This is entirely understandable. They’ve come to me because whatever they’re doing at the moment has caused them trouble, and they want to fix it so the trouble goes away. But there’s a logical fallacy at work, and a misunderstanding about what education is about. There’s also often a degree of self criticism. These are big topics and I want to take time to talk about them, so this week I will deal just with the logical fallacy. Next time I’ll talk about how our concept of education holds us back. Finally, I’ll talk about the issue of self criticism. I am doing it the wrong way. If this was true, we would first have to decide if there was only one right way, or if we would allow One Right Way for each circumstance (eg dining chair, office chair, car seat). At the very least, we’d end up with a list of Right Ways to suit our usual set of furniture and circumstances. But what if the circumstances subtly alter – like having to get into the car with the seat a little further forward than usual? We would either have to suffer Doing Something Not Right, or make sure we constructed a set of Right Ways to deal with all conceivable changes of circumstance. And then we’d end up with a big list of Right Ways. And we’d have to memorise them all. That sounds like a lot of work to me. I’d much rather learn the principles behind constructing a Best Way (for now) for any circumstance as it arose, and then learn how to think and apply it moment by moment. In the end, it’s just so much easier. And that’s what Alexander Technique lessons are: learning how to construct a Best Way (for now) for the moment that you’re in. Don’t be fooled by the apparent unthinking simplicity of the One Right Way. It leads to lists, prohibitions (mustn’t do the wrong thing! ), and complexity. Go for gold, and learn how to reason out the Best Way (for now) instead. Sitting all day – is it evil? Is sitting all day evil? There are increasing numbers of articles in fashionable magazines and on trendy websites that will tell you that yes, sitting is intrinsically evil and can kill you. The Huffington Post, for example, seems to run an article on the evils of sitting every couple of months. I mean, we always knew that sitting, especially sitting all day was a problem. 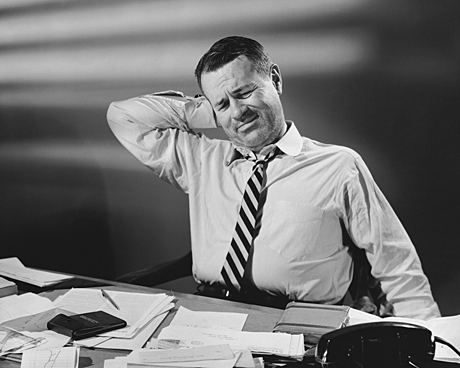 Huge numbers of people experience discomfort through sitting, especially at their desks and computers. Backs, necks, shoulders all seem to beg for mercy. But now we’re told that sitting isn’t just uncomfortable – it can actually shorten your lifespan. Is it true, and what can we do about it? That’s the advice Marc Hamilton, director of the Inactivity Physiology Program at the Pennington Biomedical Research Center in Louisiana, gave to the magazine Runner’s World. Apparently, sitting for long periods may cause an enzyme called lipoprotein lipase to decrease in the bloodstream. As this enzyme clears noxious fats out of the bloodstream, this is bad news. Apparently this sends out harmful biological signals that could be implicated in cardiovascular disease. According to the articles I’ve seen, sitting still for long periods has been linked to not just obesity, but cancer, cardiovascular disease and diabetes, though personally I’d want to see more studies come up with similar results before I got too worked up about the evidence. But before you panic and throw away all your chairs (as some people have done, and would advise you to do – see this article), let’s examine the issue with the clear-sightedness that FM Alexander would want us to use. Sitting is part of our normal range of movement behaviours. It’s one of the things we are designed to be able to do. If we say that one movement behaviour is intrinsically bad, how many others will we find that are just as evil or worse? What about rock climbing (all that looking upwards), or playing the violin (having your head tilted to the side can’t be good for you, surely) – should we ban those, too? If there’s a problem with sitting all day, that’s not the chair’s fault, but ours for thinking that doing any one thing for prolonged periods isn’t going to have repurcussions. It’s a bit like food. I love chocolate, but I don’t eat it every day. I love carrots too, but if I ate them for every meal I’d soon turn orange. Who tied us down and forced us to sit in the one spot all day long? Problem 2: Will exchanging standing for sitting be any better? Instead of sitting all day, why not stand up or work out? A lot of authors out there on the web are telling their readers to exchange their chairs and conventional desks for ‘standing workstations’ or treadmill desks. Is this a good idea? Well, it depends. FM Alexander would tell us that many of the problems we experience are not context-related (relevant only to a specific activity), but are the result of a deterioration in the general manner of use of ourselves. In other words, there’s a way we like to use our bodies – maybe tightening neck muscles, or raising shoulders, or jutting pelvis forwards – that we bring into every activity that we do. And in some of those activities that general way we like to use ourselves becomes problematic. If this is the case (and Alexander Technique teachers down the decades have anecdotal evidence that this is true), then just swapping standing for sitting isn’t going to help, because we’re going to bring our poor manner of use along into the new activity. If we keep our shoulders raised all the time, we’re going to do that while we’re standing, and the knock-on effects of that through our whole system is going to generate achiness in just the same way it did while we were sitting. It might move or be subtly different in some way, but the cause is the same. So the whole ‘sitting is bad for you’ campaign has two major flaws: the chair didn’t make us sit for prolonged periods, rather, we did; and there’s nothing to say that standing or using a treadmill desk is going to be any more beneficial in reducing overall harm to our systems. What, then, should we do? I’m going to give you three top tips. 1. Don’t sit still! Take breaks! Chairs are just a tool, in the same way that a computer keyboard is just a tool, or a hammer is just a tool. We need to decide how to use them safely. So don’t sit still for long periods. Get up and walk around once an hour, even if it’s just to the water cooler and back. If you can’t trust yourself to remember, set a timer. 2. Think about your general use of yourself. Do you hunch your shoulders? Do you jut your pelvis forwards, or crane your head forward on your neck? Do you permanently have one shoulder raised so your handbag won’t fall off… even if your handbag isn’t there? Start taking the time to observe yourself dispassionately, or see an Alexander Technique teacher for some advice. Read the articles. Check out the research. Make sure that you understand the issue before you do anything drastic like junk your furniture or spend thousands on a treadmill desk. Do what seems best for you in your circumstances, taking the research into account. You may well decide that the cardiovascular benefits of a treadmill desk are exactly what you need! But don’t be rushed into anything without thinking about it. Maybe Hamlet had it right when he said “there’s nothing either good or bad, but thinking makes it so.” Let’s stop blaming the tools, and start reasoning out how to use them effectively.